Cricket Mein Kuch Kala Hai. Cricket is an Indian religion without any formal god and temple but yet like religion people showered their praises and hard earned money on unofficial gods and their priests for their love for the game. Board of Control for Cricket in India (BCCI) is a private entity uncontrolled by any government agency and out of the reach of RTI (Right To Information). In spite of irregularities, immoralities, corruption and unlawful acts in this organisation no political party is bothered to clean it. On the contrary political parties and business tycoons enjoy representation in various state cricket boards nobody knows why and nobody has any objections about it. Hum Saath Saath Hain on such issues. 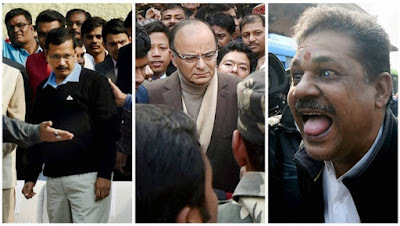 BJP MP Kirti Azad lost his party membership on raising DDCA (Delhi Districts Cricket Association) corruption issues and alleging Finance Minister Arun Jaitley who headed DDCA during that period for hiding its financial irregularities. Hum Bolega To Bologe Ke Bolta Hai but why a government who said that it is intolerant to corruption not remove the one who has spots of allegations but sacks one who raised corruption issue. Earlier Ajay Makhan of Congress too faced the similar fate when he was demoted from its post of Sports Minister for bringing a bill to regularize the working of BCCI during his tenure in Congress lead UPA 2 government. Arun Jaitley also filed a defamation case against Delhi chief minister Arvind Kejriwal and four other Aam Aadmi Party (AAP) leaders for framing him in DDCA scam. Why? Kyun? If he is innocent he should resign , face an inquiry , come out clean and hurrah! Your opponents fall flat on their face completely exposed in front of people of the country which is bigger than any penalty or punishment. Par Golmaal Hai Bhai Sab Golmaal Hai, our politicians more keen on politicizing the issues than to kill them for always. Remember Babri Mazjid, Godhra riots, 1984 riots, emergency, JP movement, Anna Movement, these and many more issues are brewing in Indian political diaspora to mislead public from real issues of poverty,unemployment and hunger. Corruption in cricket now is not a new topic, match fixing, money laundering and other economic offenses are commonly reported but sadly no strong action against any culprit ever happens which further encourage these irregularities. Choddo Kal Ki Batein, it's never too late Modi government should set an example, hopefully next year we have better cricketing atmosphere till then God Bless India. Corruption is the new religion.